Home Commentary Column: Are America’s teachers really underpaid? And political leaders have taken notice. For example, presidential hopeful U.S. Sen. Kamala Harris, a Democrat from California, has made boosting teacher salaries a part of her campaign. Her plan would allocate $315 billion in federal funding over the next decade to increase pay for public school teachers and reward state and local governments for raising pay even higher, with the goal of eventually boosting teacher pay by an average of $13,500 per person. 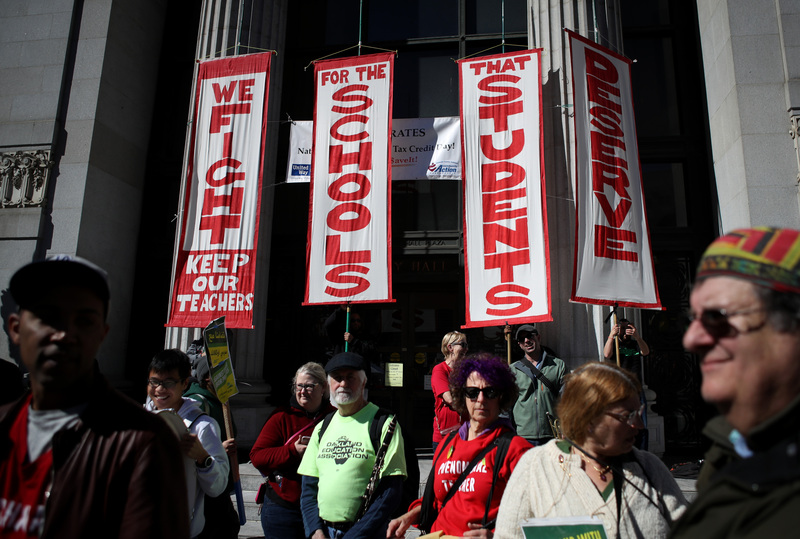 The proposal, which has been hailed as “the largest investment in teachers in American history” and criticized as a pitch for teacher union endorsements, would be paid for by as-yet unspecified increases in the estate tax. From my standpoint as an expert on educational leadership and policy and as former assistant state superintendent for research and policy in the Michigan Department of Education, I see teachers as the most important resource in schools. Teachers’ impact on students persists into adulthood. Recruiting and retaining high-quality teachers in the nation’s public schools requires good working conditions, including competent and supportive leadership and a collegial environment. But pay matters. According to an Economic Policy Institute study, the teacher “wage penalty” – how much less teachers make than comparable workers – grew from 5.5 percent in 1979 to a record 18.7 percent in 2017. In 39 states, the average teacher salary declined 2010 and 2016 when you take inflation into account. And these declines were not the result of teacher turnover, with retiring and relatively well-paid baby boomers being replaced by entry-level millennials. A 2018 Brookings study found that teachers were more qualified in 2016 than in 2007. Teachers were older and more educated, with greater proportions holding master’s and doctoral degrees, the Brookings study found. The pay gap gives rise to teacher shortages. These shortages do not show up as actual vacancies or empty classrooms. Rather, they appear as under-qualified teachers – that is, more positions filled by teachers lacking full credentials and holding only temporary or “emergency” licenses. Shortages in math and science have been a chronic problem for public schools, as non-teaching options have been much more lucrative for candidates in these fields. Mike Addonizio is a Charles H. Gershenson Distinguished Faculty Fellow and Professor of Educational Leadership and Policy Studies at Wayne State University and a member of Wayne State's Kaplan Collaborative for Urban Education. He previously served as Assistant Michigan State Superintendent for Research and Policy. He holds a Master of Public Policy from the University of Michigan and a Ph.D. in Economics from Michigan State University. Many peeps are grossly overpaid, such as hedge fund managers and corporate lawyers. Teachers are underpaid, but not as badly as manual laborers and nurse aides, etc. These stores about teachers claiming they are forced to work second jobs as waitresses and cab drivers and so forth, seem to be stretching.